It is hard to overestimate Howard Cable’s contribution to band repertoire. He wrote for this medium throughout his career and he knew it with an unsurpassed intimacy. It is easy to forget that, hardly more than a boy, he graduated from the Royal Conservatory in Toronto with a degree in conducting and bandmastership, a degree that one suspects was made for him. Howard first worked with the Wellington Winds as conductor in 1988. Already past retirement age, he was youthful and ready for a continuation of a career that was ongoing literally until the day he died. He was working on a program for Symphony Nova Scotia and was scheduled to attend a recording session later in the day. Between 1988 and 2016 he composed as much music as many do in an entire career, especially for bands of all levels, brass and winds. That 1988 concert showed just how wide-ranging his skills were. It included three of his original works for band, two of which were his most beloved medleys, the Quebec Folk Fantasy, and the Newfoundland Rhapsody, and one in which everything including the melodies was original, the Stratford Suite. That performance also included Howard’s arrangement of the overture, The Bridal Rose, by Calixa Lavallée, the French Canadian composer of O Canada. 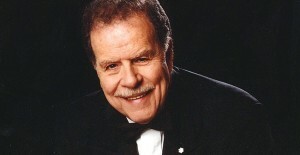 Howard returned once again as guest conductor in 1995. You can hear our performance of his Stratford Suite from that concert on our YouTube channel, under Howard’s direction. Howard was always happy to provide wonderful arrangements for band of the music that he loved. And it is as an arranger that he is most remembered. On that score he was nothing short of amazing. Until very recently, even though he had trouble standing, he continued to conduct full programs of his big band arrangements, all by memory, to full houses. The Wellington Wind Symphony invited Howard to direct them again in October, 2006. This time, most of the music he chose to direct was original and recently composed for band. It was a memorable concert, and we continued to develop our relationship with this great musician. He returned once again in 2011 to help us rehearse his Banks of Newfoundland, an event that we captured on video. This is Howard’s reworking of what has been lovingly dubbed “The Newfie Rhap.” Howard’s music is challenging, and he wanted to make this work more accessible to community and school bands. Bringing the best out of young musicians was another of Howard’s life-long interests. A outstandingly gifted musician, he will be greatly missed, and his music played for generations to come.